Hello December. I am so glad you are here and although 2015 flew by, I am ready for this month and for everything that lies ahead in 2016. 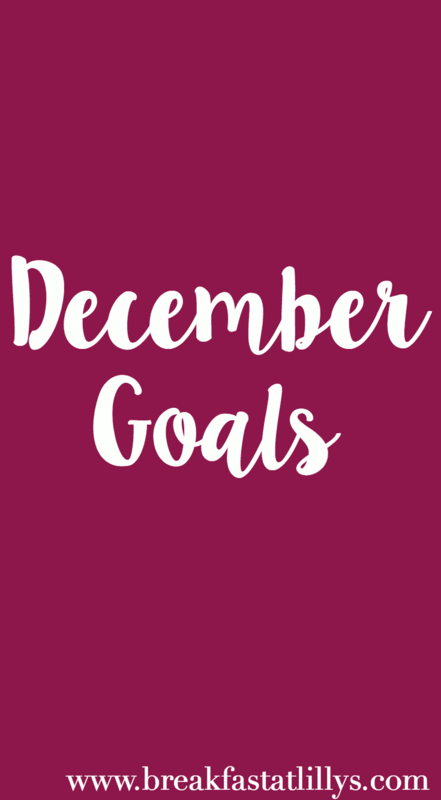 Now onto recapping my November goals and sharing my December goals. Read at least one book // Check! I actually was able to read two books this month! My favorite of the two being Dark Places by Gillian Flynn. I highly recommend it. Save money // Did this as well! I just have a few more Christmas presents to buy and then I’ll be spending a lot less and be able to save even more. Finish my stats class with an A // Although my class doesn’t technically end until Sunday, I completed my final early and actually got an 100 on the final so I was pretty stoked and thus ended up finishing the course with an A. This was my first A in a math class since god knows when. Get a consistent cleaning schedule // I am going to count this as a half completed goal because I have been managing to keep my house from being a complete mess but still don’t have any real consistency with when I do my cleaning. Start working out 3 times a week // This was a fail…but Michael and I set up a game plan to start next week and I am sticking to it. So 3.5/5 officially complete, not too bad I’d say. Pick my wedding photographer and videographer // Our wedding is a little under a year away but I would love to nail down these details now so that there’s one less thing to worry about in 2016. Get some blogging goals in place for 2016 // I just want to get some goals going for the new year so I can continue to see growth throughout the years to come. Read at least one book // I loved getting back into reading again so I’d love to be able to read another book this month. Go to the gym at least once a week // Before it was twice a week and it wasn’t happening, so I am starting small and will work my way up. Hopefully I can get on track and going to the gym once a week at the very least will become a piece of cake. Finish tweaking my blog posts and making them all SEO-friendly // I switched over to self-hosted WordPress from Blogger in October and haven’t finished fixing my posts and making them SEO ready so I hope to finish that this month. What are your December goals? Let me know down in the comments.